More and more organisations are adopting Agile techniques and approaches. Agile adoption brings about changes to processes, approaches and roles, and some BAs can be left wondering where they fit into this new world. Lynda will cover what it means to be an Agile BA, and how as an Agile BA you can bring value to your organisation through having the right mindset and a comprehensive toolkit. What is an Agile BA? Lynda has over 25 years' experience in business and systems development as a consultant, professional trainer and practitioner in both the public and private sector. She has extensive experience of adding value to organisations at a variety of levels, including coaching agile development teams and assisting board level change projects. Lynda’s particular strength is applying business analysis and agile techniques together to help organisations overcome challenging business problems. Lynda is the co-author of the book ‘Agile and business analysis’ published by the BCS, Chartered Institute for IT in Feb 2017. 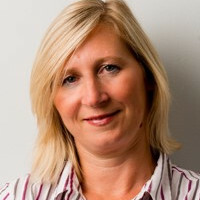 Lynda currently works for CMC Partnership Consultancy Ltd where she is Head of Profession for Business Analysis as well as their Lead Agile BA. Lynda has delivered numerous presentations and keynotes to European and international audiences covering subjects on business analysis, agile and business change.